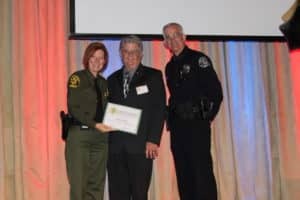 Dean receiving OCSD Citizen’s Academy diploma from O.C. Sheriff Sandra Hutchens. He has a hands-on knowledge of how these agencies work and think. Dean understands how they can best protect Los Alamitos. 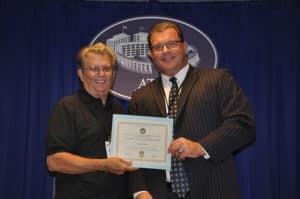 Dean receiving his Citizen’s Academy diploma from the Department of Justice. The War on Drugs has a high cost – the youth of our nation. After attending several Citizen’s Academies, Dean volunteers with the Department of Justice to inform and educate our community on the dangers of drugs. He formerly served on the local Youth Center board of directors for eight years. 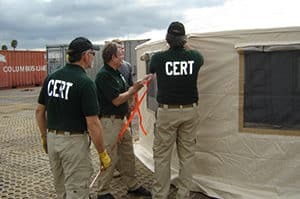 The Community Emergency Response Team (CERT) program educates volunteers about disaster preparedness for the hazards that may impact their area and trains them in basic disaster response skills, such as fire safety, light search and rescue, team organization, and disaster medical operations. Ask Dean about joining this great community program.